Nik Silver Efex Pro is a powerful black and white converter in the Nik Collection. It helps you to easily achieve adjustments that could leave you scratching your head in Photoshop. And in Lightroom similar adjustments might not even be possible. Two of the adjustment sliders in Silver Efex Pro that are very difficult to replicate are Soft Contrast and Dynamic Brightness. In this tutorial I’m going to show you how to use these sliders when converting photos to black and white. You can learn more about the Nik Collection on the Lenscraft Nik Collection Tutorials page. The following video tutorial explains the two sliders, Soft Contrast and Dynamic Brightness a little more. 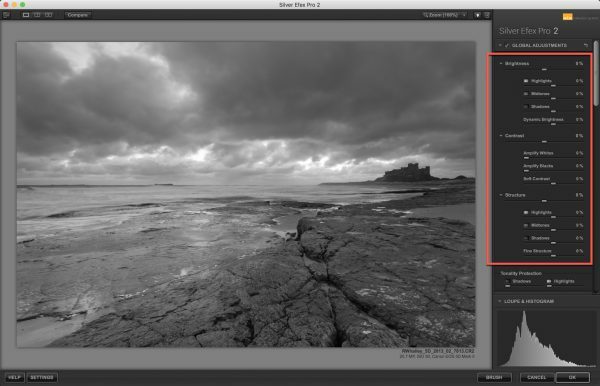 It also demonstrates the Nik Silver Efex Pro workflow covered by this tutorial. This video is part of my Bitesize Nik Tutorials series published on Youtube. If you haven’t yet subscribed to my Youtube channel you can do so with this link. I publish a new video each week and am happy to consider requests for specific tutorials. When you want to understand what effect a slider is having on your image, don’t watch the image, look at the histogram. By watching the histogram as you move a slider, you can understand its effect on the image. Here’s an example of what happens to the histogram in Silver Efex Pro when we move the Contrast slider to the left. You can see that the negative Contrast adjustment has caused the histogram to gather into the midtones area. The adjustment has also removed the black and white tones from the histogram which will cause the photo to appear flat. Now compare this with the effect of moving the Soft Contrast slider to the left. At first glance the histogram appears similar to the Contrast adjustment slider. But look closely and you see the effect on the histogram has been less severe. We can also see there are a few tones remaining in the black and white regions of the histogram. The difference becomes obvious when you examine the adjusted images. Notice how the Contrast adjusted image appears very flat. This is because all the tones are now in the midtone area of the histogram. When we compare this to the Soft Contrast adjusted image, we can still see black and white tones. The image appears more like poor HDR. How Should I use the Soft Contrast Slider? The Soft Contrast slider is very useful as a global adjustment. Put simply, if you want to open the shadows in the image, move the Soft Contrast slider to the left. If you want to darken the photo and create atmosphere, move the Soft Contrast slider to the right. In the video at the end of this tutorial, you will see the effect of the Soft Contrast explained in greater detail. The video also explains the Dynamic Brightness slider, before demonstrating how to use these two powerful sliders in your Nik Silver Efex Pro workflow. Check the Colour Filters and colour Response sliders first. This can help to create separation of tones in your image and reduce the severity of other adjustments you might need to make. Apply selective adjustments using Control Points. Apply finishing touches like a vignette or edge effect. It’s at step two in this workflow, the Global Adjustments, that we encounter the Soft Contrast and Dynamic Brightness sliders explained in this tutorial. The following approach is very effective when applied to the Global Adjustments in Silver Efex Pro. 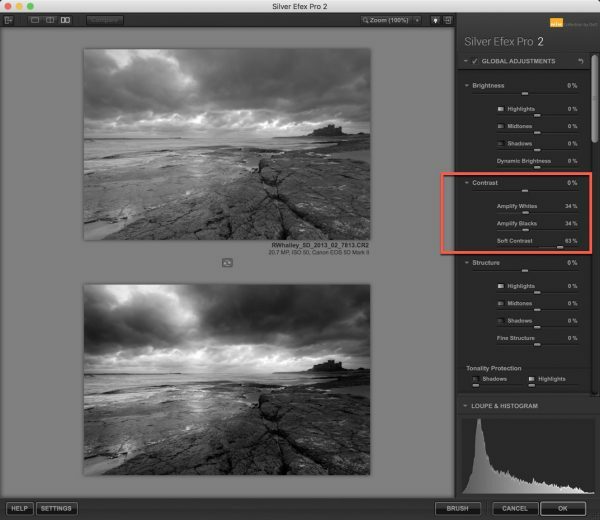 There are three groups of controls in the Global Adjustment section of Silver Efex Pro. These are Brightness, Contrast and Structure. Unless the exposure of the image you’re converting is completely off, start by adjusting the Contrast controls. And if your exposure is completely wrong, you should go back to the RAW conversion stage and correct it there. The adjustment sliders in Nik Silver Efex Pro should be used to refine and improve the black and white conversion. They are not for correcting image problems. In the Contrast slider group, we will start by applying the Soft Contrast slider to either open the image shadows or close them and add atmosphere. In this example the image is stormy, so we will close the shadows further by moving the Soft Contrast slider to the right. This helps to emphasise the atmosphere and drama in the photo. Once we have done this we may need to open the shadows a little if they have become too dark, by using the Amplify Whites slider. We can use the other similar slider (Amplify Blacks) to darken the lighter tones in the image. You can see the result of using all three of these Silver Efex sliders in the screenshot below. Here you can see the effect of the Contrast adjustments (outlined by the red box) on the image. The original image is at the top and the adjusted image below it. One you have your Soft Contrast and Amplify adjustments in place, you can apply any additional Contrast adjustment. If you find this causes your image to appear a little too dark, work through the three slides again to refine your adjustments. You shouldn’t need to make large changes. With your Contrast adjustments in place we can turn our attention to the Brightness adjustments. Here you will find five sliders, Brightness, Highlights, Midtones, Shadows and Dynamic Brightness. The Brightness slider allows you to make all the tones in the image either lighter (by moving the slider to the right) or darker (moving it to the left). The Highlights, Midtones and Shadows sliders do the same except they only affect a specific tonal range in the image. The Dynamic Brightness slider is like the Brightness slider in that it affects the entire tonal range. But its also different in that it protects the black and white points in the image, leaving them relatively unchanged. Start by adjusting the Dynamic Brightness slider, moving it left to darken the image or right to lighten it. You can then use the Highlights, Midtones and Shadows sliders to fine tune the image. In most cases you won’t have need to use the Brightness slider unless the image exposure is completely wrong. In the following screenshot of the image in Silver Efex Pro, you can see the Brightness adjustments applied to the image. Notice how dramatic the lower photo appears when compared to the starting image at the top. You may find that some areas of your photo don’t respond well to strong Global Adjustments. In this example, the castle has become very dark and now appears as a silhouette against the sky. One solution is to protect these areas using the Tonality Protection sliders in Silver Efex Pro. You can see these to the bottom of the Global Adjustments panel. Here you can protect both the Shadows and the Highlights using the relevant sliders. As you move a slider to the right, you will see the lightest or darkest tones in the histogram move towards the centre. This prevents the tones becoming pure black or pure white and losing detail. You should be cautions when using these sliders. They can leave the image appearing a little flat and affect the contrast. If you find this is happening, consider using Control Points to target the problem area rather than the Tonality Protection sliders. If you would like to know more about the Bitesize Nik Tutorials series, you can view the Playlist on Youtube. I’m adding more videos all the time. To learn more about using Nik Silver Efex you should also watch turning a dull grey day into a dramatic black and white landscape.